Yeah, you head that headline right. 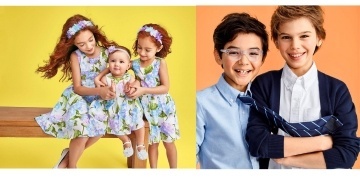 Just about EVERYTHING at Carter's Canada seems to be on sale this week, starting with spring outerwear, Skip Hop and jammies for 25% off. There doesn't seem to be a start or end date on any of these deals, but I can promise that they'll only be around for a limited time. And since you can pick up this adorable three-piece Bunny PJs Set for just $18, why wait? The deals don't even end there. Carter's also has select doorcrashers from $7, which include this Mommy's First Mother's Day Collectible Bodysuit that you HAVE to pick up for the new mommas in your life. Plus, if you shop in-store, select dress-up items are half-price! But whatever you're looking for, you may want to pick up a few things. That's because orders over $50 ship free, and with these deals, it'll take a little bit to reach that minimum spend.